Author(s) Levine, David, M.; Stephan, David, F.; Szabat, Kathryn, A. This pack contains 1 copy of Statistics for Managers Using Microsoft Excel, Global Edition + 1 printed access card to MyLab Statistics with eText. Statistics for Managers Using Microsoft Excel is the gold standard for learning how to use Microsoft Excel® in business statistics, helping students gain the understanding they need to be successful in their careers. The authors present statistics in the context of specific business fields; full chapters on business analytics further prepare students for success in their professions. Current data throughout the text lets students practice analyzing the types of data they will see in their professions. The friendly writing style include tips throughout to encourage learning. The book also integrates PHStat, an add-in that bolsters the statistical functions of Excel. 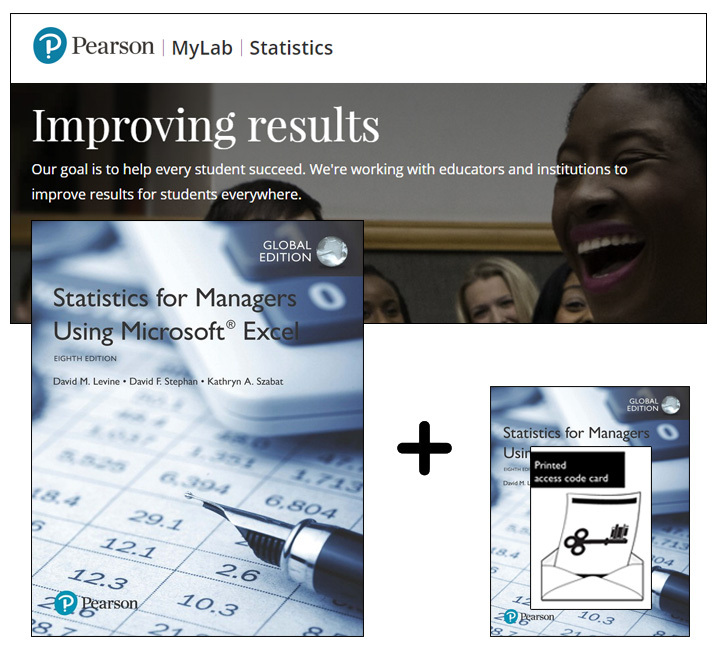 MyLab Statistics from Pearson is the world’s leading online resource for teaching and learning statistics, integrating interactive homework, assessment, and media in a flexible, easy-to-use format. MyLab Statistics is a course management system that delivers improving results in helping individual students succeed. MyLab Statistics is not a self-paced technology and should only be purchased when required by an instructor. The duration of access to MyLab Statistics is set by your instructor for your specific unit of study.